Renowned Screens Producer, Laura Frank, chose the disguise (formerly known as d3) 360-degree virtual reality pre-visualization software to take Nike’s event planning to the next level, providing both creative and technical production teams with a fully immersive 3D experience of the NBA launch ahead of time. Nike teamed up with the NBA to weave NikeConnect technology into this season’s NBA jersey. The industry giants came together at Sony Studios in Los Angeles to announce the partnership at a spectacular visual event, featuring huge moving screens and players from all 30 NBA teams. Dominating the event were three 35-foot tall LED screens that glided throughout the 75x75 foot space on automation tracks supplied by TAIT. Starting as one gigantic screen at the beginning of the show, they slowly split into three to reveal a two-tier display wall of the team's new Statement Edition uniforms. 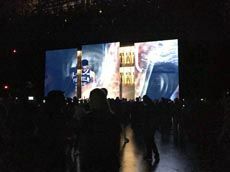 The screens then moved through the space to allow the NBA players, who were wearing the new kit, to take center stage, before recombining after a 12-minute presentation to become the backdrop for hip hop artist Travis Scott’s performance. Thanks to VR previs, show producers were able to visualize the show in 3D virtual reality before arriving onsite. VR is currently a beta feature in disguise’s 14.3 software release. Laura Frank, Screens Producer for Luminous FX, had seen the VR technology demo’d at Prolight + Sound last spring and knew it would be the best way to bring the vision to life for the Nike team ahead of the launch.